Elizabeth @ Don’t Call Me Betsy is starting a new linky party on Fridays called Quilty Flashback Friday. Her kick off post and linky party are up on her site today, and she talks about one of the first large quilts she made: Quilty Flashback Friday: The One With My Castle Peeps Quilt. Taking a stroll down memory lane, I want to share a quilt I made in 2009 with you today. 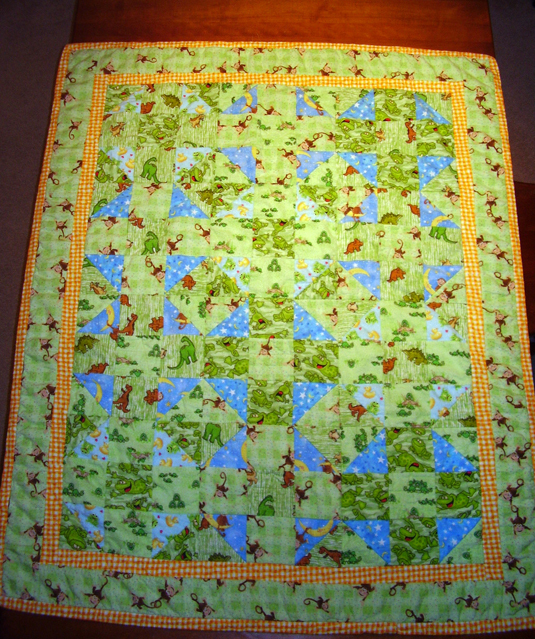 Although I pieced my first quilt top in 1995 and made several quilts before this one, the creation of this flannel baby quilt marks the start of a period of time that really saw my interest and skills in quilting begin to rapidly increase. My friends were expecting their first child, and I really wanted to make a quilt as a gift for them. They are really lovely people, and they enjoy astronomy as a hobby. They have made their own telescopes and live in a beautiful area that affords them dark, clear skies and lots of opportunity to star gaze. Thinking about them and introducing their child into their lives, I wanted to make a warm and snuggly quilt that they could wrap up their child in to keep warm when they were outside star gazing. Working with that thought in mind, I first selected a group of flannel fabrics. As this was the first quilt I had put together in some time, I recall that it took me almost a month to piece together the top. 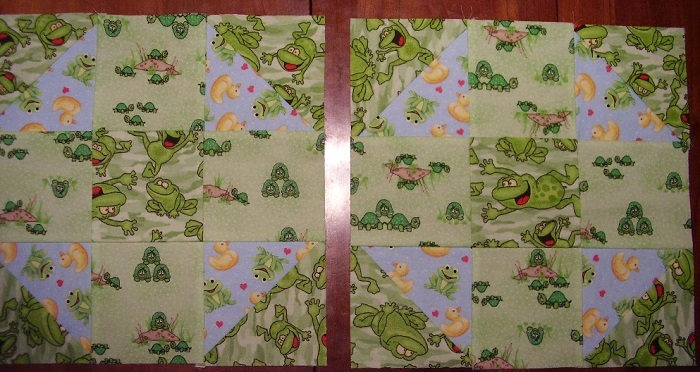 I recall being really excited about making up my own pattern and creating the first blocks. Especially because they turned out so well; it gave me a really big sense of accomplishment. Along the way, I realized that I was going to have to consider what fabric to use for the quilt back, so the final fabric used in the quilt top was changed so that I could piece together a backing. Instead of the paw prints being the final border, I used more of the monkey print for the border instead. Which left me plenty of material to make the backing. While my photography at the time leaves a bit to be desired, I am just so thankful I have photographs of the quilt at all. Most of my earliest quilts are just memories with no photography to document them. I believe I just did some simple stitch in the ditch quilting with a bright yellow thread. And last but not least, here is a photograph I took of the quilt just prior to packing it up to ship off. I was really excited about this quilt and it really catapulted me into years of creation that have brought a lot of peace, satisfaction, and joy into my life. 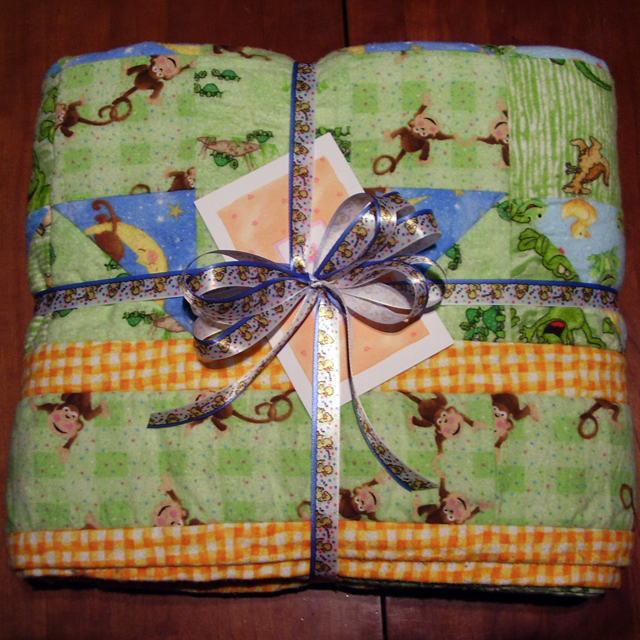 Flannel Baby Quilt – Ready to Gift! It’s always so fun to look back and see what we’ve accomplished and how far we’ve come. So glad you had pics of your quilt. I like that monkey print – too cute! Cute quilt! I really like the monkey print too. I find flannel a little difficult to work with because it stretches. It also fills my machine with LINT. I do like it for baby quilts, though! Lovely trip down memory lane! Your friends and their baby were very lucky to receive such a nice gift from you. How sweet! I’ve never pieced in flannel, but I do love this quilt. I was given a really cute fat quarter bundle of flannel that I haven’t broken into yet. Did you find it hard to work with? 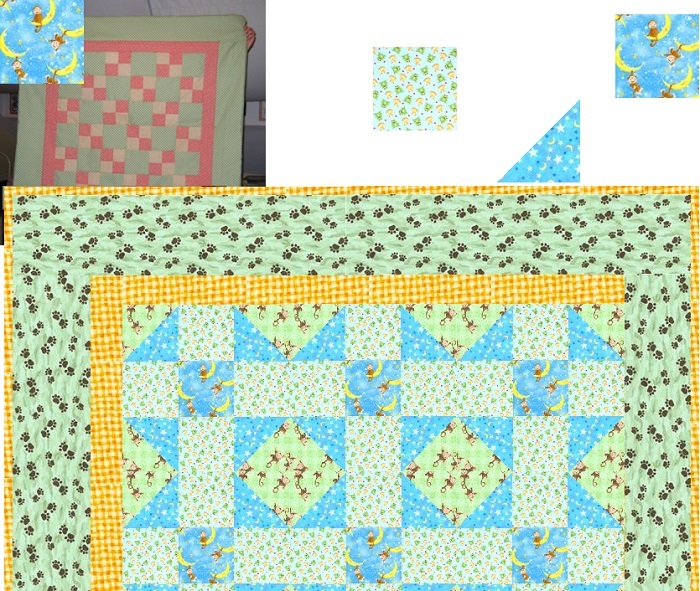 I love how you create a quilt digitally first. Such a sweet story. 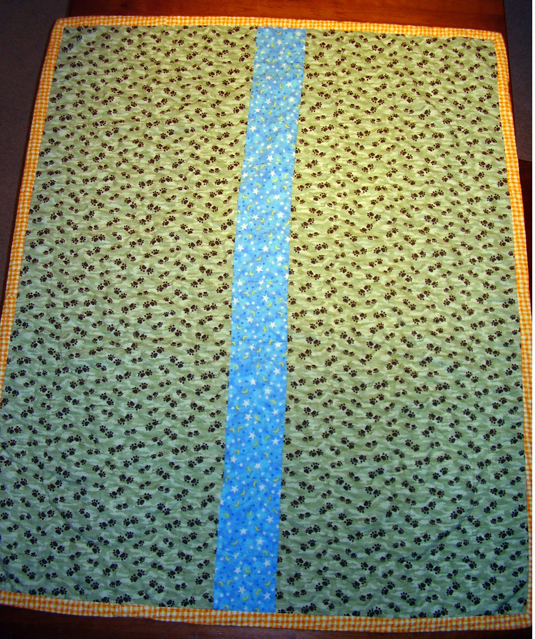 I just got some pictures of quilts I made in 2004-6 and will post about them soon. It is nice to look back on the treasures made long ago. Frogs, monkeys, turtles and ducks! How adorable! 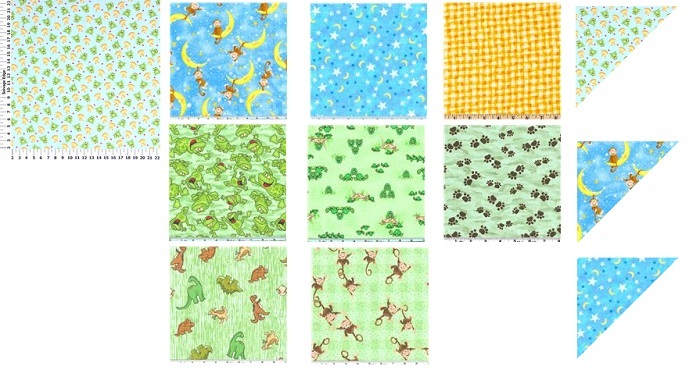 Those are great prints for a baby quilt! 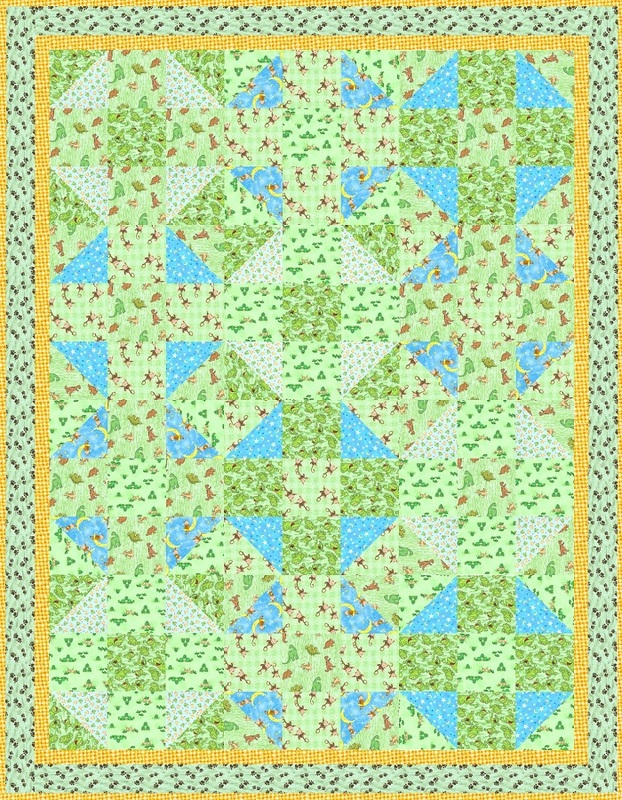 I like the simple block too – works well with the happy fabric. I really like how you used MS Paint to work up your quilt design. I have never thought of it. Your baby quilt turned out cute. Baby quilts are some of my favorite quilts to create. I have not made one entirely of flannel yet. I did make a faux chenille blanket with the five layers of flannel quilted together. It was lots of work but so wonderful in the end. Thanks for sharing your quilt. It’s so lovely- and all the more special for being your own design. I’m sure it kept the little one very warm and snuggly under the stars! What a fun idea for linky. Those fabrics are really fun too 🙂 It is great to take a minute and look back. Good for you, having so many photos of your older works! That’s the one thing I wish I could go back in time to tell myself, was to take more pictures (although I would have loved to also teach myself how to use my camera properly back then!). What a sweet baby gift, and I love all the things you remembered about making this quilt, like the sense of accomplishment you felt in designing it. I hope you enjoyed digging through your personal archives to play along with Quilty Flashback Friday, and hope you’ll play along again! What a sweet little quilt! Thanks for the heads-up about the linky too. Sounds like a fun one!